Transplant Australia is proud to announce that for the first time in many years, two Australian children and their families will be attending a unique ski camp for transplant children in the Swiss Alps later this month. Deakin Tran (8) of Western Australia and Bradley Stanley (16) of Canberra fly out to the ‘Tackers’ ski camp next week with mums, Brooke and Katie as support. 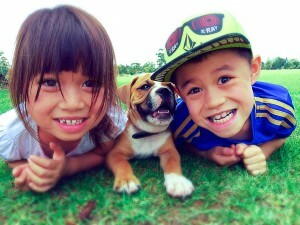 Deakin Tran (right) is pictured here with his sister, Ashlyn and their dog, Hugo. Deakin had a liver transplant in 2008 and has been going strong ever since boasts his mother, Brooke Tran. ‘He enjoys playing soccer, cricket and going fishing but this will be his first time touching snow and going skiing. It’s the trip of a lifetime for him, seeing Switzerland and being able to mingle with other kids who have also had transplants. I’m hoping it will teach him some independence because he’s had to be so reliant upon me so far,” said Brooke. Bradley Stanley, also a liver transplant recipient (2002) formed a unique bond with Scott Bellingham, a fellow Canberra resident and liver recipient, while attending the Australian Transplant Games. Scott was many years older than Brad and acted as a mentor to him. The pair became great friends and supports to one another, especially during times when they took ill or were hospitalised. 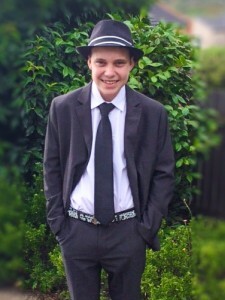 Bradley Stanley wearing Scott Bellingham’s fedora hat, 2015. Of his Tackers experience Bradley is most looking forward to free time where he can snowboard from the top of the mountains. ‘I won’t be wearing wrist braces or anything. I’m going snowboarding. I want to live. If I get hurt, it’s just part of life and the experience,” he said confidently looking forward to the challenge. Tackers unites children from all over the world who have had transplants in an environment outside of the hospital. The camps allow them to socialise with other children who have shared a similar journey while experiencing a unique adventure packed holiday, enjoying alpine sports in a beautiful part of the world. The camps also teach the kids valuable skills such as how to manage their post-transplant medication, and live a healthy, meaningful, active life. The experience boosts their confidence and is a wonderful display of thanks to the donor families who get to see the positive impact of their ‘gift of life’. Transplant Australia would like to thank Brian Fraser at Tackers.